PHOTO BY NICOLE WALBY Graduates listen to a speaker during the Vanguard-Sentinel Career and Technology Center Gateway, Ohio’s Options and GED graduation ceremony Wednesday in Fremont. 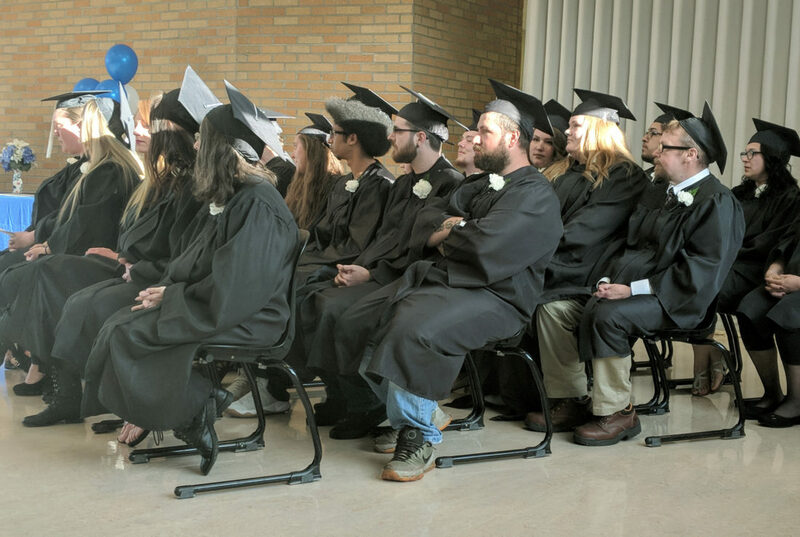 FREMONT — Twenty graduates participated in the 2017-18 Vanguard-Sentinel Career and Technology Center Gateway, Ohio’s Options and GED graduation ceremony Wednesday evening. “Graduation, no matter what institution, is the best day of the year,” Heath Martin, assistant vice president for Student and Enrollment Services at Terra State Community College, said. Martin was the keynote speaker. Martin said he hoped it was the first step in their journeys. “I want you to know that college is possible,” he said. Martin shared his own college journey, which he thought never would happen since he graduated 25th of 27 students in his class in a small Kansas town, with a grade point average of 2.0 and the reading ability of a sixth-grader. Martin said he wanted the graduates to know college is possible and that is where they belong. He also said each graduate is to receive a $500 scholarship if they enroll at Terra State. Fostoria native Atricia Hohman also shared her story. Hohman said she was one of the first students to attend Aspire classes at Fostoria Learning Center. After 63 learning hours, she earned her GED. Hohman said motivation from a friend helped her get into the Aspire program. She said support from family and friends helped her persevere. Graduates included Kaylay DeLaRose from Fostoria Learning Center; Christina Billow, Elizabeth Long and Alexia Tolley of OhioMeansJobs of Seneca County; Josette Mulcahy from the Port Clinton Library; Hunter Clark, Margaruite Dresch, Alan Elkins, Steven Johnson, Allan Wobser and Brandon Write from Vanguard Career and Technology Center; Johnny Gray Jr. and Victoria Wenzlick of the Ottawa County Resource Centre; and Mariah McNeal and Roger Daniel-McNeal of Owens Aspire Guests. Gateway graduates included Miranda Boley and Amanda Rivera from Fremont Ross High School; Tiffany Torres of Port Clinton High School; and Juan Cordova of Toledo Waite High School.